Ok, let’s be real. When you think about the Microsoft Dynamics CRM Outlook Client, “Track in CRM” is usually the first thing that comes to mind. The reason so many of you use Microsoft Dynamics CRM is because of Microsoft Outlook integration, and when you think about Outlook integration, you think about Track in CRM. Well, we took Email and Appointments to a whole new level in Microsoft Dynamics CRM 2011. But what if I get lots of emails, from lots of people, and I don’t want to manually create them every time? 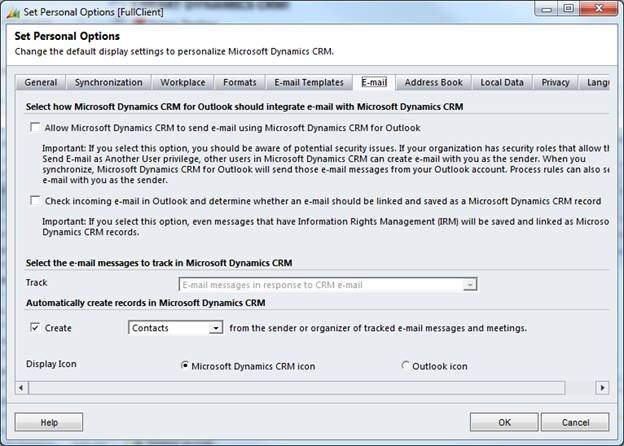 Well, in the new Microsoft Dynamics CRM Outlook Client, you’re able to have contacts/leads auto-Created from sender email id just by Tracking the Email. And you won’t have to search around in complex menus for your CRM options anymore, just click on “Options” in your reading pane to manage these settings! So if Track in CRM wasn’t your favorite feature, it should be now! But we didn’t just stop there, let’s look at the cutting edge in CRM Email and Appointment integration. One of the things we’ve heard you loud and clear on is that you don’t want to choose between the richness of outlook, and the flexibility of CRM. 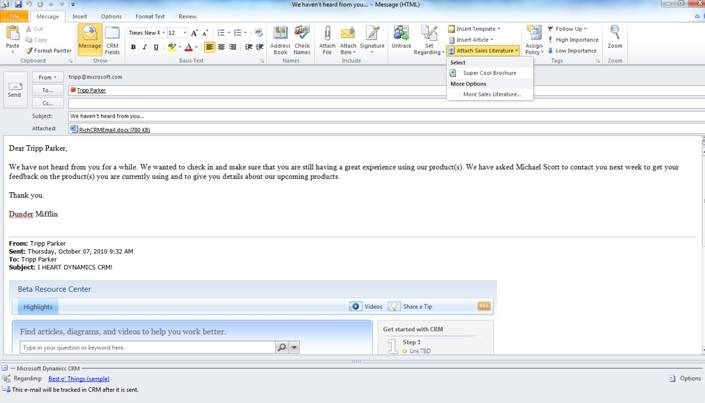 You want to have the rich surface of Microsoft Outlook to type your emails (I can’t live without spell check), but you want the flexibility of CRM (Mult—language email, anyone?). You want your custom fields, your web resources, your sales literature, your KB articles, and of course your email templates while sending business emails via Outlook. 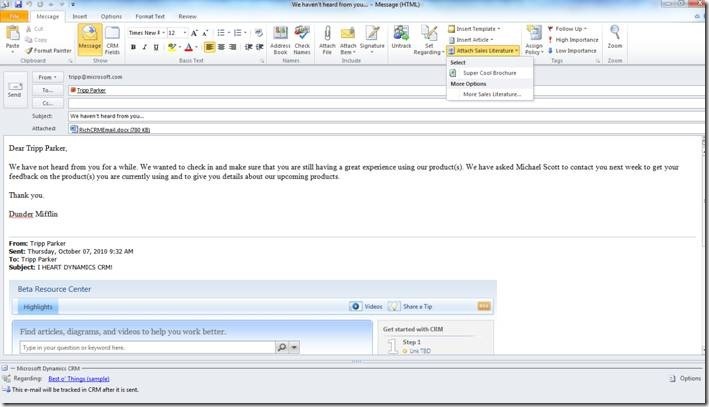 Your CRM templates, KB articles, and sales literature are all easily accessible from your Outlook Email Form. We also gave you a Most Recently Used list, so you can quickly get to the items you use most often. Some of you are wondering, though, what that “CRM Fields” button does? 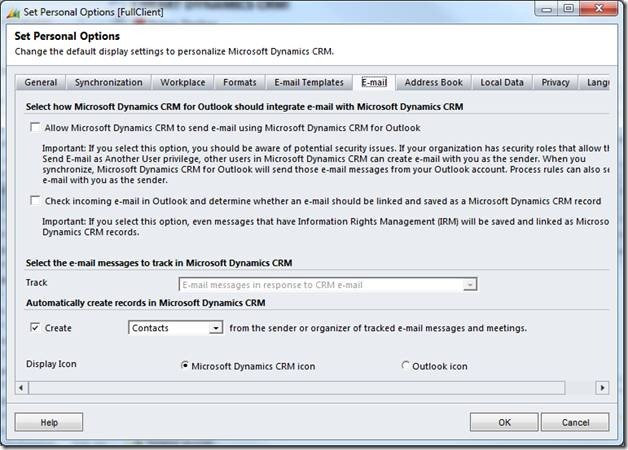 Well, that gives you the ability to edit your custom CRM fields directly from your Outlook Email Form! 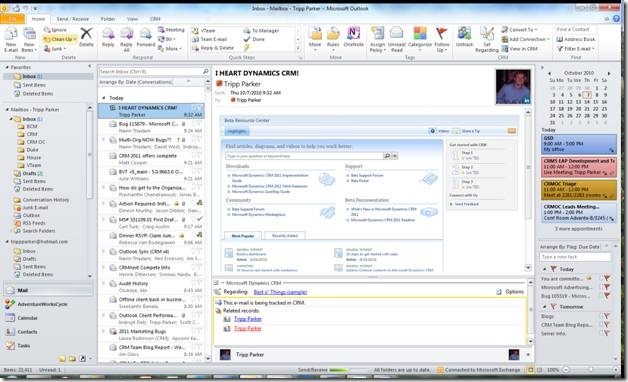 So no more writing emails, Tracking them, sending them, then finding them in CRM to edit your CRM fields. You can do all that in the same window in Outlook! 1. By customizing the fields on your CRM email, they will show up in the CRM Fields page. Feel free to high five the person next to you. 2. The CRM Fields page is also available for Appointments as well. I suggest a chest bump this time. 3. You can also now Track recurring appointments. Victory Lap! Anything you’re still wondering about? Just let me know. Stay tuned for more posts on how administrators can administer CRM data filters, and the story about Multi Instances inside your Outlook!